on 03 June 2012 . FROM POLAND - "Accessible Society – Myth or reality for Hard of Hearing People?" FROM THE MANUFACTURERS - NEURELEC - more dates! 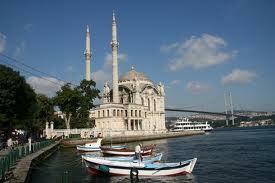 Summer is coming and there is another year before the next meeting in Istanbul. We thank Brian Archbold for his informative report of the innovative and valuable meeting in Tallinn. We look forward to hearing about all your activities in the coming months and reporting on them in the Autumn Newsletter. Please can contributors ensure that their emails are labelled ‘EURO-CIU’. There is a possibility that I may delete emails for security reasons if I do not recognise the sender. Do keep writing. We were delighted to welcome the distinguished politician, Mr Hanno Pevkur, to open the EURO-CIU Workshop and General Assembly in Tallinn. 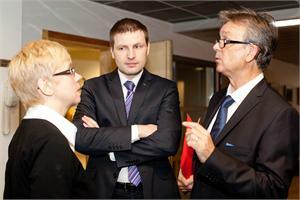 Mr Pevkur is Minister of Social Affairs for Estonia, a position he has held for over three years. He spoke eloquently about the benefits of having representatives from so many countries in EURO-CIU, and he said how pleased he was that this year’s meeting was being held in Estonia. Our President, Gilles Cognat, then thanked Estonia for hosting and arranging the Workshop and General Assembly. The Workshop was carried out by Estonian consulting firm, Implement Inscape, and the two trainers certainly kept us busy for the full day! The room was very well laid out, with tables for five or six people – and there were named places, so that people from the same organisation didn’t sit with each other! • Communication tools for international communication. First of all, to get us thinking about the different types of people that make up any organisation, we were asked to decide which of four characteristics was our strongest character type, and then to group together in the four corners of the room. There followed a discussion on the benefits of each character type, the strengths and weaknesses of each type, and how we can get the best out of each other when working together. One of the goals of the workshop was to offer participants an opportunity to share their recent experiences, exchange ideas and share best practice. Before the workshop, each participating organisation was asked to prepare a poster giving information about their organisation’s mission, major achievements in 2011 and main obstacles faced at the present moment. A representative from each organisation was then given a couple of minutes to give a very brief résumé about their organisation to the whole group. Back in our groups of five or six people, each group was given “Flip Chart” paper, with one question to answer – each group had a different question. We then had five minutes to write down our ideas and answers to the question. The papers were then rotated, so that each group then got given the next question. 1. What opportunities do you see for EURO-CIU members to collaborate? 2. What kind of common activities do you see relevant for EURO-CIU members in the coming years? 3. 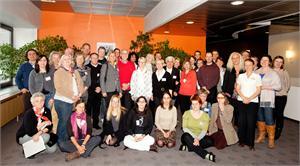 How could we make communication between different EURO-CIU member organisations more effective? How can each member be better informed? 4. How could EURO-CIU communicate its goals and activities outside its members and influence important stakeholders (eg pan-European structures)? 5. What additional funds do you see available for EURO-CIU activities? At the end, all the ideas were put on the wall for participants to see and rate, selecting the top three ideas for each question. This gives the EURO-CIU Board clear prioritised actions to follow up. There was then an exercise for two larger groups, using story cards which we could not show each other. By describing the activities on each card, we then had to work out a story line. Whether or not we got the story absolutely correct, it just showed the value of good communication between members of a group! Finally, Dr Michael Goriany gave a presentation on the possibilities of using online communication between members. We have asked Michael to write an article about this for a future edition of the EURO-CIU Newsletter. The General Assembly was held on the Saturday, and Minutes of the Meeting will be produced by the Board in due course. We would like to thank Epp for the excellent organisation, including headphones which enabled us to follow the proceedings in French, German and English. Thanks also to the two excellent Palantypists for both days, Susie Lithman Romeo and Jean Gough. Dr Ruud Van Hardeveld was unable to attend the General Assembly this year, so Sari Hirvonen-Skarbö gave Ruud's presentation on his behalf. A separate supplement will shortly follow this Newsletter, giving the salient points from Ruud's research. Regine likes the subtle tones of the singing bowl and can now follow a conversation with closed eyes, seven year old Hannah loves the stories her mother tells her and John is delighted that he can manage to locate the call of a buzzard. What connects all three is that they can hear with their cochlear implants. Without them they are deaf. They all know how the cochlear implant brings back quality of life. ‘Listening with CI improves the quality of life’ is the motto of the 7th German CI-day on 9th June which will be nationwide. There will be more than forty events throughout Germany organised by self help groups, CI clinics, rehabilitation centres, educational institutions and ENT departments to draw attention to their efforts to enable deaf people to integrate into the hearing world. There will be information booths, lectures, presentations, children’s parties and many other activities. The patron of the event is Günter Beckstein, Bavarian CSU politician and former Prime Minister. Beckstein is hearing impaired and has had a CI for almost two years. The German Cochlear Implant society and its affiliated regional organisations will take the opportunity to publicize that having CIs is a life changing event for a deaf person. The CI day shows how hearing impaired people can help to change society by talking openly about their problems and how the self help groups provide information and advice and a forum for the exchange of experiences. They also demonstrate that being deaf is not the end of the world says Franz Hermann, president of DCIG. The potential of CIs to restore hearing is widely publicized and to draw attention to the DCIG there will be a nationwide launch of balloons with the motto ‘deaf but still listening’ punctually at twelve o’clock. Anyone who finds a balloon will also find attached postcards details of how born deaf children, young deaf people and adults can benefit from CIs and they will also have a chance of winning a balloon ride. On the eve of the “Sign Language and other forms of communication Act” becoming a law in Poland, EFHOH Board held a seminar organised together with our new member: the Polish Foundation of Hard of Hearing (PFOS). PFOS and EFHOH worked together to highlight lack of understanding for hard of hearing and deafened people needs, and the fact that new Act, despite having “other forms of communication” in the name, it doesn’t support the speech to text interpreting needed by many HoH or deafened who do not use Sign Language. The current situation means, that any HoH or deafened person needing support in communication will only be offered sign language interpreter, they can’t ask for STTR as they are not recognised as an equal support. There is no requirement for public offices to fit an inductive loop system either. The seminar on Saturday gathered subtitlers, captioners , providers, representatives of other associations and many hard of hearing people to discuss the current situation in Poland with respect to provision for those with hearing loss with special focus on subtitling access. We listened to personal accounts of growing up with hearing loss and education barriers, presentations from those who work in the subtitling field, also presentation about inductive loop systems and Marcel gave presentation about EFHOH work in EU. We received a very good feedback from those attending as for many; there was lots of new information. This event was the actual follow up from International Summer Holiday in Szczyrk last summer, where for the first time we introduced speech to text reporting in Poland. Our speech to text reporters in Warsaw, Petter and Oskar Thorin , our speech to text interpreters, became instant celebrity showing that HoH and deafened people can have equal access via text. Day earlier, we held our Spring Board meeting at the office of INTERGRACJA, a disability organisation supporting our work. I arrived in Poland a day earlier to deliver training to members of PFOS; “The art of Assertiveness”. The aims of the training was to equip young HoH people with tools to deal with ignorance towards their needs and how to be assertive and yet….not seen aggressive. I was very pleased with the positive response from students, showing the need of this kind of confidence building training for affective advocacy and lobbying. One of highlights was a visit to the National Theatre on Thursday 29th March, where I was able to experience IR loop system and live captioning. The event at the theatre was possible thanks to a project called “Beyond silence and darkness”. 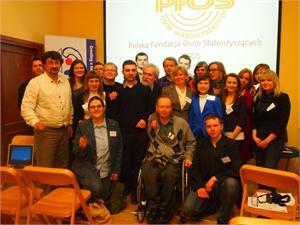 The project receives public funding to enable those with hearing and vision loss to enjoy the theatre in Warsaw. I would like to use this opportunity to thank my fellow Board members for the support they gave to help raise awareness in Poland and to all those who participated in the seminar. Special thanks to the Board of the Polish Foundation of Hard of Hearing also to “Shalom” and “INTEGRACJA” for help in making this event possible. It is interesting to read the report written by the participants of the event, it was so inspiring to see young people getting active in advocacy. On February 25th, the Federación AICE celebrated the International Cochlear Implant Day with various events throughout Spain. Every act had one thing in common: the reading of the Manifesto called “Cochlear Implant Day”. In Valencia, on February 10th, almost one hundred people gathered in Escuela Tantien, a gym. While parents and adults attended some lectures about rehabilitation guidelines to perform at home and about how the economic crisis can affect Cochlear Implant users’ issues, children enjoyed Kung-Fu classes. In Castilla la Mancha, on February 24th, a group of students learned, through play, what is a Cochlear Implant and they pretended to be archaeologists looking for the earliest remains of the Cochlear Implant at the Parque Arqueológico de Segóbriga. In Aragón, on March 3rd, around fifty people enjoyed a visit to the former lignite mine “Se Verá”. In Catalunya, on March 4th, more than a hundred people went to Torres vineyard in Vilafranca del Penedés (Barcelona) and they ended the day with a calçotada, the traditional Catalonian meal based on the calçots (a kind of onion). And in Asturias, on March 10th, Cochlear Implant users and their families went to Bowling Park at the Parque Astur in Covera, to spend a funny afternoon playing bowls, pools, etc. The main event of the celebration took place the same February 25th in the IMSERSO’s Auditorium in Madrid. Lectures about the new publications from Federación AICE, about the upgrade of speech processors, about the latest technological news and social networks communication between Cochlear Implant users were given. As always, the event was accessible through live transcription and screens for the speechreading. The day concluded with a friendly meal for the 200 or so people who came. Van is near our country’s biggest lake “Lake Van” in eastern Turkey. On 23 October 2011 there was earthquake of a magnitude 7.1 Mw and on 9 November 2011 there was another one of a magnitude 5,5 Mw. 63 teachers and 636 people lost lives. 252 people were rescued alive. In Van where approximately 50 CI Users lived, most of our CI Users’ houses were destroyed or they collapsed, but none of our CI users lost their lives. Education in schools was suspended for a long time due to earthquake. Students were sent to the other major provinces to prevent the disruption of their education. Due to the severe damage caused by the earthquake there was a huge migration from the city. People whose homes were destroyed, started to live in container houses or in tents set up in satellite cities in the bitter winter. Today a new city is being built and new houses are being given to our citizens. The Turkish Cochlear Implant Association and Hacettepe University Cochlear Implant Team, which is one of the Turkey’s leading clinics, with the support of professionals from Van University Faculty of Medicine, University Clinic of Ear, Nose and Throat a family meeting was held about four months after the earthquake. CI Users and families from 6 different cities were participated in the gathering. 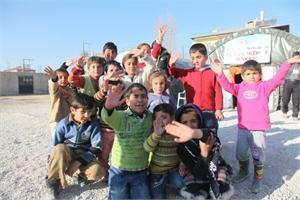 After the earthquakes, batteries, replacement parts and clothes were sent to our young CI Users and the others. Inevitably some of our users, who are in school age, left the area and went to different places. For this reason their follow up is continuing different regions. When new school year begins in September, we will again go to the area to help our young members there. 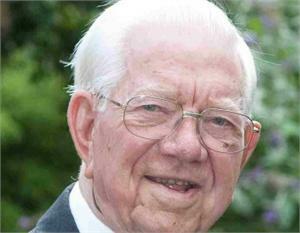 It is with great sadness that we have to report the death of our President, Jack Ashley, on 21st April 2012 aged 89. He became a Member of Parliament in 1966 but a year later he totally lost his hearing following a failed operation. Instead of resigning, with the encouragement of many people and the support of his wife Pauline, he started out on a successful career as a politician. He learnt to lipread and later on had the use of Palantype in the chamber to follow the debates. He was a great campaigner but his especial interests were forwarding the interests of disabled people especially the deaf. He founded the All Party Disability Group at Westminster. He led the campaign for sub-titled television, which is now a great boon to millions of hearing impaired viewers in the UK, and the fight for compensation for the victims of thalidomide. He joined the movement to end discrimination against disabled people which led to the passing of the Disability Discrimination Act 1995 (now subsumed into the Equality Act 2010). From the beginning he was interested in cochlear implants but initially money was short and the large deaf voluntary organisations were very cautious about committing themselves to promoting a new unproven and expensive treatment especially in the face of opposition from the deaf community. Jack successfully campaigned for NHS funding for a pilot research programme which was set up in 1988. Following his elevation to the House of Lords Jack himself had a successful cochlear implant. Realising that a cochlear implant user group could have a powerful voice in promoting cochlear implants Jack and his wife Pauline founded the NCIUA in 1997. Under his inspirational chairmanship the association flourished. In spite of his many commitments he always found time for the association and committee meetings were held in the Palace of Westminster. After ten years as chairman due to the need to scale back his heavy workload he resigned and became President in 2006. He was also Patron of The Ear Foundation and President of Action for Hearing Loss (formerly RNID). Our sympathies go to his three daughters and their families. We have lost a great man and a doughty campaigner. Many UK members of EURO-CIU have put their own tributes on the website http://www.lordjackashley.co.uk/ . As one of the presenters of the European conference “Deaf and Hearing Impaired Children in Europe” which took place in London in May 2005, I met Lord Ashley at this conference for the first time. I quickly found out, he was a unique politician, with special interests in hearing loss. He was involved in many organisations working with deaf people and supported many initiatives that have improved the quality of life for people who experience hearing loss or deafness. As scientific advisor of Euro-CIU I would like to convey my deepest condolences to Lord Ashley’s family. The Ear Foundation holds an annual Family Education Weekend at Center Parcs in Sherwood Forest, and this year was the 20th supported by Cochlear. For the first time the weekend included an adult conference and therefore catered for all ages and proved to be very enjoyable and informative. Friday night began with a Talent Show for the youngsters. The “Ear Foundation has got talent” was introduced by Colin Wells – a parent of an implanted girl and a professional actor. His dynamic, personable approach is always popular and he introduced each sketch, helping the children to relax on stage and prove that our children definitely ‘do have talent’. A seven year old magician made cards disappear and reappear and then there were singers, dancers, a Cruela de Ville sketch, Spanish sketch and finally a young drummer beating to the song ‘We Will Rock You’. On Saturday morning the Venue was a hive of activity, with stalls giving valuable information for the hearing impaired and workshops in two separate conference rooms. It was great to welcome NDCS, Action on Hearing Loss, Phonak, Cochlear Implanted Children’s Support Group, Mary Hare School, St John’s School for the Deaf, Doncaster School for the Deaf, Nottinghamshire Fire and Rescue and Nottingham Sensory Service. Workshops covered Pre-School Issues for Parents, Moving on to Secondary School, Moving on to Higher Education, Communication & the Teenage Years and “Leaping on with Language” for parents of primary-aged children. After an excellent lunch, giving children and adults alike an opportunity to talk to each other, the main conferences started. The children were organised into age groups and a team of superb volunteers helped to entertain them with constructive activities. The Family Conference was introduced by John Atkins, Chair of the Trustees. He thanked everyone for their support and introduced Sue Archbold, the Chief Executive of The Ear Foundation. Sue has a wealth of knowledge and it is always a pleasure listening to her speak passionately about the progress of The Ear Foundation. She discussed the advances over the last twenty years and was very enthusiastic in her presentation of the proposed SoundSpace at The Ear Foundation and reasons why more space is needed; the photo of the project certainly looked impressive – only the money is needed! It was a joy listening to the second speaker, Bethan Hindson. 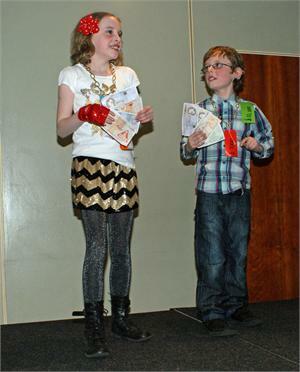 Bethan was implanted at eleven and she talked fluently about her cochlear journey. The support of her parents was evident and greatly appreciated by her as she moved through her educational and social development. She in now happily married and training to be a vet after achieving a degree and masters in History!! She was awarded the Cochlear Graeme Clark Scholarship this year. Everyone was impressed by her modest presentation and delighted that she shared her success story. 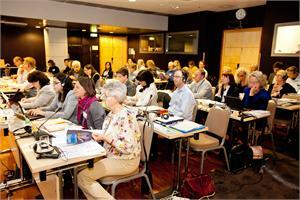 We heard from Lisa Aubert, Kate King and Clare Sheridan about recent developments at Cochlear Europe. The next speaker was the surgeon, Doug Hartley. He gave a fascinating insight into the actual operation, and showed a number of scans at angles of the area around the cochlear! His presentation culminated in a video of the operation as he talked us through the procedure in such a relaxed way that even I, who am squeamish, was engrossed as he ‘tucked to bed some spare muscle to keep the coil in place in the cochlea’. It was amazing to watch! After a short break Connie Mayer, a teacher of the deaf from Canada, gave us an excellent talk on the impact of cochlear implants on children’s literacy. She gave parents many ideas how they can be actively involved in helping to develop their child’s literacy. Parents always find practical ideas so helpful and her PowerPoint presentation married well with her reasons why and how to improve reading and writing in the primary child. The final speaker was Brian Gale. He gave us a spirited account of how we can access legal help if needed. Many parents of deaf children find themselves in educational disputes and in the current financial climate many services are being cut. His talk was very encouraging in that there is help out there for parents to access if you know where to find it. He has a wealth of experience that parents can tap in to at NDCS. The conference finished as the weekend had started, with Colin Wells introducing a few of the Talent Show performers. In parallel with the main Family Conference, there was a conference for adults. It was a packed programme that was attended by cochlear implant users and parents of young adult implant users. The afternoon’s activities were introduced by Susan Hamrouge who co-ordinates the Sound Advice (Adult) programme at The Ear Foundation. The first speaker, David Walton, gave a passionate talk about his cochlear journey covering the challenges and benefits. Susan led a workshop discussion, which tackled issues such as communication challenges and how to get what you want from a conversation whether it is signed or spoken. The discussion was lively and good humoured with everyone in the room making a contribution. Claire Henson gave a presentation to explain Access to Work entitlements and how to get them. After a short interval Lisa Aubert, Claire Sheridan and Kate King gave the group a presentation ‘Cochlear. Hear Now and Always...what does this mean?’ The audience were really interested to hear Kate talk about advocacy and felt this aspect could be explored more for future conferences. The final presentation was by Abigail Greenwood who gave an account of her personal journey, which was an example of how family support and Abigail’s positive attitude led her to become a successful cochlear implant user. The adults, who already attend Sound Advice days, were brimming with ideas about future topics whilst the parents of young adult implant users, as well as the young people themselves, thought it was a vital step to bridge the gap between the transition from children to adult expectations. Watch this Space! What a delight to be part of such a varied programme, with excellent speakers giving us vital information to help us develop our deaf child, to finish by watching them perform so confidently – what an uplifting day, and something for everyone of all ages. We already have next year’s conference at Center Parcs pencilled in our diary – 1st to 4th March 2013 – sun glasses already packed! 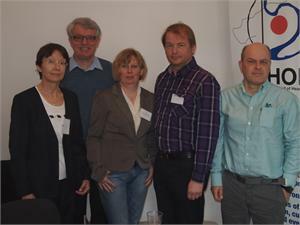 Representatives from the European Union of the Deaf (EUD) attended the recent Ear Foundation Workshop in Mechelen, Belgium: Sign Bilingual Education and New Technologies. The EUD team was pleased to see a conference being organised on the topic of sign language in education, as sign bilingual education is one of the main aims of EUD within the scope of equal access to education following Article 24 of the UN Convention on the Rights of Persons with Disabilities (UNCRPD). The conference was able to highlight a number of problems and issues of children using sign language in the classroom. 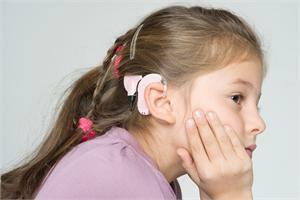 EUD is concerned, however, about the lack of concrete statistical information regarding educational outcomes of deaf/implanted children in mainstream settings as opposed to their hearing and speech capabilities. EUD had attended a previous Ear Foundation conference entitled: Deaf Education: Changed by Cochlear Implantation, which was based on the very well researched book by Ear Foundation director Sue Archbold. Additionally, EUD would like to point out that although a large number of children are now implanted, giving them access to sign language should not be seen as impeding their spoken/aural development. The role of ‘additive bilingualism’ should not be underestimated and although measuring the understanding of speech can be of advantage, it should not be used as an indicator as to whether a child needs a sign language interpreter/sign language environment or not. Understanding speech in a quiet environment in a one-to-one situation is not to be confused with a child being able to function adequately in a noisy classroom or group discussions. Sign language must be seen as a viable option for children who cannot access education by using speech alone. This will allow children to become familiar with both signed and spoken/written languages enabling them to choose the most adequate language for any given situation. EUD urges other countries to keep track of both educational and social developments of implanted children in order to measure the effectiveness of the programmes. More information on EUD can be found online on our website: http://eud.eu/ and on our Facebook page: http://www.facebook.com/eudeaf . A few years ago, finding a fun picture book about a deaf child with a cochlear implant proved to be difficult - so much so that we published our own series called My Brother John. We did it for our hearing daughter and our son, who is deaf and uses a CI, following our visit to the John Tracy Clinic (JTC) in Los Angeles. The JTC Summer School focuses on the whole family and had a specialist sibling programme and it was that element of the programme that was our inspiration to develop the children’s book My Brother John. The first book has been successful, not only was it featured in The Times, but was sold around the world as far a field as Australia and South Africa. Now over 3 years on, My Brother John has grown up. We now are into our second edition and we have added a few pages of explanation about hearing aids and cochlear implants – there are book marks, mugs and merchandise to support the development, with over 500 followers on twitter and a Facebook page. What’s more surprising is that it has been translated into Spanish and Mi hermano Juan is the latest step on our journey. It was translated by two sisters in the USA and we know it has already made some impact on the Hispanic community in the LA. Mi hermano Juan, written from the sibling’s perspective, subtly informs about the cochlear implants in a fun way. The book is available in the UK and through The Ear Foundation. It was always our intention to make the whole publishing project more personal and after some research with parents we discovered that many parents with deaf children want others to understand about their child and their needs. The result of this has been the setting up of a new web service called Experience Books. It enables parents and/or professionals (teachers of the deaf, audiologists) to sit down and work through a series of questions online that address their child’s needs on a basic level that others can understand. Users can create a character with hearing equipment, including CIs in different colours and they can personalise text to specify the content of a full colour A4 sized book. This allows it to be shared and read and makes it difficult to hide so teachers should be able to use it at circle times. There are girl and boy versions with many different character options. Whilst the end result was intended to be a printed book to explain all about the son or daughter or pupil – we have lots of comments explaining that just by completing the process with the child gives the opportunity to discuss the child’s issues and we know this is having a positive effect. Translations are the next planned step if there is any interest from mainland Europe. We are now asked to develop CI illustrations and create characters with CIs. Having a child who is deaf has been character building in more ways than we could have imagined. The Charity “Destiny of a Child” continues to support The Ear Foundation and the Cochlear Implant Centre in Paris (Ceop), and last year they made large donations to these charities, when the team organised a challenge of a lifetime: climbing Kilimanjaro. This funding has made a huge difference to these organisations – both in the UK and France. They are now planning on repeating this mammoth event AGAIN in 2013 and to raise even more funds for The Ear Foundation and the Paris Cochlear Implant Programme (Ceop). 1. 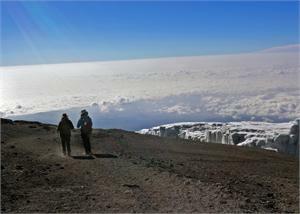 Climbing for Children: An ascent of Kilimanjaro to the summit at 5,896 metres/19,340 feet with an experienced expedition leader, Ake Lindstrom. 2. Building for Children: participating in the building of six Child Welfare Centres in Arusha, Tanzania. Local builders will support the volunteers with this project and no special skills are needed. Each participant will be required to raise a minimum of £1,500 in addition to covering the cost of flights, transport etc. NB: Closing date for Applications is 31st July 2012. More convenience — Universal compatibility with AB processors and designed with detachable cables. No matter which of AB’s cochlear implant systems is currently used, our new headpiece will be compatible! Additionally, the headpiece is now designed with more robust connectors and detachable cables, available in varying lengths and colours to suit all users. When it comes time to replace a cable, there’s no longer a need to order an entirely new headpiece. The Universal Headpiece will house as few as one or as many as five magnets, four on the inside and one additional on the underside, offering the most adjustable magnet strength of any AB headpiece to date! No two cochlear implant recipients have the same hair type, same skin flap characteristics or same preferences for the fit and feel of their headpieces. The UHP is designed to suit most recipients’ needs for a “barely there” feeling providing all-day comfort while wearing the UHP. 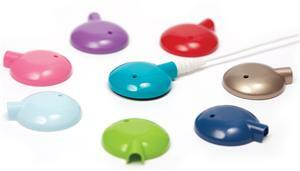 The UHP snap-on colour caps are available in a variety of colour choices, including new blue, pink and purple options. Additionally, Skinit designs are available online for users to further enhance the look and style of their UHP. Built on AB’s HiRes Fidelity 120™ (HiRes 120) technology for high-performance hearing, ClearVoice™ was designed to automatically analyse and adapt to each listening situation encountered throughout the day, separating the distracting noises from speech to enhance communication. The technology was developed to help recipients communicate clearly and confidently in a variety of challenging listening situations. Several studies have been conducted throughout the world to document the benefits obtained with ClearVoice and, here, we present a summary of the findings. A multicentre survey compared HiRes 120 to ClearVoice Medium and ClearVoice High in over 100 adult AB recipients across Europe1. Each program was used for one week in rotation. Participants then completed a questionnaire on their listening experience with and without ClearVoice. The results indicated that two thirds of subjects preferred the ClearVoice programs for everyday listening. Among them, more than half reported being willing to use the ClearVoice programs all the time, while the others would prefer switching ClearVoice on and off depending upon the situation. In a study conducted in Singapore 3, it was shown that not only did the subjects show significant improvements in speech understanding in noise (English and Mandarin HINT) with both ClearVoice Medium and ClearVoice High compared to HiRes 120, but they also generally agreed that ClearVoice had a positive impact on their emotional well-being in more challenging listening conditions. ClearVoice experience with children was also collected, in a study conducted at the Robert Debré hospital in Paris, France 4. The aim of this study was to compare HiRes 120 to ClearVoice Medium and ClearVoice High in 9 paediatric AB recipients. Although testing the three younger children was sometimes challenging, statistics showed significant improvement in sentence recognition in speech-spectrum noise with both ClearVoice settings with no decrement in speech understanding in quiet. Clinical experience suggested that comfort levels should be increased by 5-10% to improve listening with ClearVoice. Both children and parents provided positive feedback on ClearVoice including less fatigue, benefit for watching TV, and better hearing in a car and on the phone. In summary, the switch from HiRes 120 on its own to the inclusion of ClearVoice was well received. In all studies, the majority of subjects preferred a ClearVoice program added to their existing HiRes 120 program, rather than a HiRes 120 program on its own. ClearVoice benefit may be enhanced through adjustments of thresholds and comfort levels. Very positive feedback was given on everyday life situations, and ClearVoice therefore appears as a solution for improving speech understanding in noise. Finally, recent preliminary work has shown that subjects may benefit even further from ClearVoice when combined with hearing aid pre-processing. Studies are currently ongoing to investigate the synergies between technology from Phonak and ClearVoice from Advanced Bionics. The Cochlear™ Baha® 3 System represents a paradigm shift in bone conduction hearing. 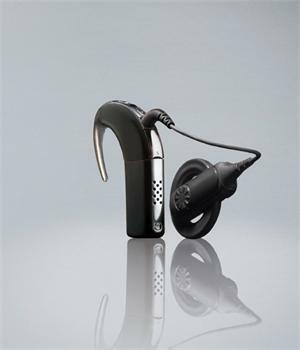 It offers a complete implant and sound processor portfolio for people with varying levels and types of hearing loss. Utilising advanced signal processing and powerful new transducer technologies, Baha 3 Sound Processors deliver premium hearing performance for improved speech understanding in noise. Including the industry’s first moisture resistant and fully programmable multi-channel sound processor, the Baha 3 System offers solutions built for the rigours of life. Validated by independent clinical studies, Baha 3 provides over 25% improved speech understanding in noise, 90% increased implant stability and a 50% reduction of the time to fitting. The Cochlear Baha BP100 Sound Processor delivers 25% improved speech understanding in noise and is the first direct bone conduction sound processor to include an advanced automatic signal processing system and dedicated amplification strategies. It uses multiple adjustable channels to support more precise fitting and to shape the signal to match your individual hearing loss. 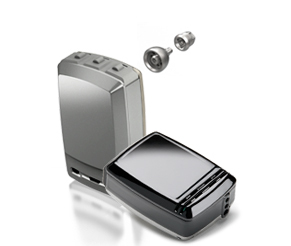 Locked out and unable to change the settings on your Cochlear™ Nucleus 5 Sound Processor? The buttons on the sound processor can be locked to prevent changing the settings by accidentally pressing buttons. This maybe ideal for children - parents can lock the sound processor buttons to prevent their child from tampering the settings. Also, you can lock and unlock your remote assistant. To lock the buttons on the processor, press both the upper and lower buttons at the same time. The LED light will flash green, then orange, and then return to a slow orange flash. Any button press when locked will result in a quick orange flash. When locked, you cannot change the sound processor settings. To unlock the processor buttons, press the upper and lower buttons at the same time. The LED light will flash orange, then green and then return to a slow orange flash. The remote assistant keypad can be locked to avoid accidental changing of settings. To lock the keypad, move the lock/unlock slider button down (located on the right side of the remote assistant). Any key presses will not work while locked. To unlock the keypad, move the lock/unlock slider up. All keys function normally when the keypad is unlocked. Using the phone is an important aspect of everyday life that patients with an implantable hearing device can learn to enjoy. As it’s such an important part of leading a normal work and social life Cochlear™ knows that patients have many questions on phone use. The main technology available to assist when using a phone is a Telecoil (t-switch or t-coil) which picks up explicitly generated magnetic fields, such as room loops and ear level induction loops (HATIS). The Telecoil works on the principle of electromagnetic induction through the production of a voltage across a conductor moving through a magnetic field – the same effect used in electric motors, energy transformers and stereo speaker systems. In the case of phone use, the phenomena is used twice. First, in the phone to convert electrical current to a sound pressure wave – otherwise known as the speaker or receiver – and second, by the Telecoil picking up the same magnetic field used to move the speaker and converting it back to electrical current which is digitized to audio for the cochlear implant. Ensure the phone’s speaker is positioned around, or as close as possible to, the Telecoil on the sound processor for best Telecoil pick up. It is important to find a mobile phone model that works for the individual. Cochlear implant recipients should visit a retail store or ask a friend or family member if they can road test their phone. Different phones have different quality signals for their Telecoil emissions and are rated according to how well they are picked up by hearing device microphones. Cochlear hasn’t tested individual models itself but something that patients should look out for when they purchase a phone are the ‘T’ and ‘M’ ratings. Mobile phones rated M3 or M4 (M stands for microphone) are likely to generate less interference for someone with a cochlear implant. M4 is the better of the two ratings. Mobile phones rated T3 or T4 (T stands for Telecoil) are likely to be usable with the Telecoil in the Cochlear sound processor. T4 is the better of the two ratings. Interference can come from the transmission signal that sends the call, from the antenna, battery or screen backlight. Mobile phones that are not Telecoil compatible will produce interference when held next to a Telecoil. Mobile phones that are not Telecoil compatible will produce interference when held next to a Telecoil. The interference is not harmful but can create noise that compromises the quality of a telephone conversation. Accessories for hands free use will help to minimise mobile phone interference by creating distance between the phone and the sound processor. It is important for patients to try different ratios to determine the best mix of sound for them. The Telecoil in the Nucleus® 5 Sound Processor will pick up the mobile phone signal automatically when it is either in auto detect mode or switched on. However, the mixing level, which sets the sound through the telephone and the external microphone, should be manually adjusted to a level of sound that suits the individual. For example, if the user prefers to hear their own voice when speaking, they should select a mix that allocates 60% of sound via the Telecoil and 40% of sound via the external microphone. A second program in the sound processor offers a mixing ratio for very noisy environments that diverts 75% of sound through the Telecoil allowing talk on the phone in environments that are often too noisy for most normally hearing people. Active and healthy ageing is important to older adults. Societal changes mean that people live longer and more active lives. Unfortunately, hearing loss is problematic with an estimated 70% of adults over 70 years affected. Age-related hearing loss (ARHL) is the leading cause of hearing loss in older adults. People over 60 years of age are often dissatisfied with their hearing aids and are unaware of hearing implants. Many feel socially isolated and experience disadvantages that are closely related to their hearing loss. ARHL and hearing implantation is a new, exciting combination that offers new solutions for older adults. 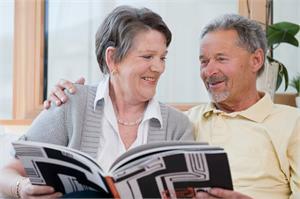 MED-EL is committed to raising awareness for older adults and hearing implantation. Earlier this year, MED-EL gathered a select group of international researchers and clinicians from otology, audiology, geriatrics and cognitive neuroscience to discuss current knowledge and identify issues for further investigation. This interdisciplinary approach was particularly well received. Presenters repeatedly pointed out the lack of awareness about hearing loss in older adults even among health professionals and its negative consequences on individuals and society. Cooperation between GPs, geriatricians, caretakers, nurses and ENTs, audiologists must be improved. Older adults with untreated hearing loss are 2.4 times more at risk of developing dementia than people with good hearing. Treating hearing loss early and keeping older adults out of managed care is an enormous financial savings for society. Another topic of interest at the meeting was cognitive abilities, which must be taken into account when treating older adults, fitting and testing them. ARHL is not only sensory but also affects central auditory pathways. For older adults, speech perception in noise is the biggest challenge. Good fitting, optimised listening conditions and regular listening training are key; MED-EL provides rehabilitation tips and training materials as well as online activities on www.medel.com . The consensus of this successful meeting was that a lot of research needs to be done in this increasingly important population. Interest in special research projects is big, and MED-EL is positive that new findings can be presented at the next research meeting in 2013. MED-EL announces the arrival of the new OPUS 2XS audio processor. Twenty-five percent lighter and 10 mm shorter than the current OPUS 2, the processor is also extra tough, thanks to improved resistance to dirt, dust and sweat. The OPUS 2XS is the optimal size for children’s little ears and is an ideal option for adults seeking a discreet processor solution. The OPUS 2XS delivers superior hearing, providing up to 30 percent better hearing performance in noise than other processors. Like the OPUS 2, it features MED-EL’s signature technologies FineHearing™ and Automatic Sound Management. The processor also offers energy efficiency without compromise. The low-profile D Coil increases energy efficiency by up to 50 percent and, for the first time, wearers can receive up to 60 hours of use from just two high-power zinc-air batteries. Existing MED-EL users can upgrade by simply adding the new OPUS 2XS battery pack to their current processor. Neurelec was present at the 12th International Congress on Cochlear Implant and other auditory technologies, held in Baltimore, Maryland USA, from May 2nd - 5th. Neurelec’s team held two symposiums to showcase its new technological trends, inform on its research and clinical results. All the pleasure was for the team to answer questions and present products and services on its booth. - 13th Congrès de la Société Internationale Francophone d’ORL - SIFORL, held in Tunisia in May 11th, 12th, 13th. - 11th International Conference ESPO (European Society of Pediatric Otorhinolaryngology), held in Amsterdam, Netherlands, May 20th - 23rd. - 4th Iberoamerican Congress on Cochlear Implantation, held in Buenos Aires, Argentina, in May 24th- 25th-26th. - 6th International Workshop and Consensus in Auditory Implants, held in Bratislava, Slovakia, from August 30th to September 2nd.